Supports a typhoon in 1-min winds, but not quite supportive of a JMA typhoon. Looking good for a typhoon. Now a typhoon according to the JTWC (65 kt 1-min). Very strong convection associated with this system. This kind of rainfall will be like a dream for the SE United States. This is still a severe tropical storm from JMA. T4.0 at 00z so probably no upgrade yet from them. Can the topic please be changed to reflect official status. How does the Dvorak scale translate for 10-min winds? I know T4.0 = 65 kt (1-min), but probably wouldn't be typhoon status for 10-min winds. Regardless, JMA now has it as a typhoon. CrazyC83 wrote: How does the Dvorak scale translate for 10-min winds? I know T4.0 = 65 kt (1-min), but probably wouldn't be typhoon status for 10-min winds. JMA does use T4.0 = 65 kts but they don't always follow the scale. CI MWS MWS EQUIV U.S.
JMA seems to be following GFS' lead in u-turning the storm. It would be more like a nightmare, the amount of rain would flood the heck out of them. That convection is very solid and perfect. Possible Fujiwhara interaction between Mitag and Hagabus? Sorry if this is out of place. I didn't know which thread to put it in, since this deals with both storms. Feel free to merge it if necessary. Don't ask me why I wrote this in the form of a scientific paper; I just felt like it. The WPAC has heated up again! Not one, but two typhoons have developed in the basin. Mitag (no, not Maytag) in the Philippine Sea, and Hagibus in the South China Sea (hereafter; SCS). Both were upgraded earlier today. Supposedly, Mitag is on a collision course with the Philippines, and supposedly, Hagibus is on a collision course with Vietnam. However, this may not be the case. This post will outline why. Mitag strengthened considerably last night as an inner core attempted to consolidate. However, with the arrival of the diurnal minimum, convective clouds tops have waned again. The JTWC forecasts Mitag to become a major hurricane prior to making landfall in Luzon in about 60 hours (see Figure 1.1). 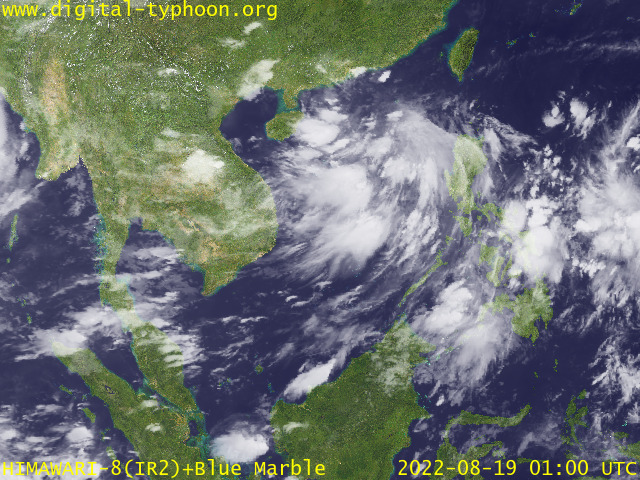 Though an eye is visible on visible shots (see Figure 1.2), weak convection is precluding a stronger storm, most likely due to possible effects of dry air entrainment to the north. In addition, latest Microwave imagery indicates a poorly organized inner core (see Figure 1.2 again). Given all the above factors, slow strengthening is more likely in the first 48 hours. Assuming no land interaction, past 48 hours, the cyclone may intensify more as the upper jet to the north moves into a position to provide greater upper diffluence. Polar outflow should remain good-excellent and equatorial outflow is fair. Figure 1.1. JTWC track/intensity forecast for Mitag, valid 22/0000. Figure 1.2. 4-panel Microwave and satellite data, valid 21/2237. Observe the poorly organized inner core. Like Mitag, Hagibus strengthened considerably last night as a CDO characterized by cloud tops in excess of -90°C consolidate overnight. This morning, patches on an eye have appeared on both visible imagery (see Figures 2.1 and 2.2), and microwave imagery (see Figures 2.1 and 2.2 again). The JTWC forecasts Hagibus to undergo little additional strengthening before making landfall in about 48 hours (see Figure 2.3). Rapidly intensifying typhoons are rare in the SCS, and unheard of in November (Holliday and Thompson, 1979). However, yesterday night's convective burst and significant intensification was likely due to strong upper diffluence due to a 100+ kt upper jet to the north. Stablilizing effects from dry air to the north were insufficiently influential. Given trends, intensification may be more rapid than the JTWC indicates, despite climatology, especially if Hagibus remains over water longer than forecast, a possibility, as explained in the next section. Figure 2.1. 4-panel Microwave and satellite data, valid 22/0010. Observe the eye. Figure 2.2. 4-panel Microwave and satellite data, valid 22/0103. Observe the eye. Figure 2.3. JTWC track/intensity forecast for Hagibus, valid 22/0000. This is perhaps the most complicated portion of the forecast. The track models for Mitag do not agree with JTWC's forecast, with many models recurving Mitag before landfall in Luzon (see Figure 3.1). Even more strikingly, the globals turn Hagibus back to the east, with the NOGAPS the only model agreeing with JTWC on a straight westerly course (see Figure 3.2). So what is the reason? The cyclones seem to be close enough, and the latest deepening now indicates they are strong enough, for Fujiwhara interaction. While many of the global models seem to hint at this (most noticably, the ECMWF; see Figure 3.3), it is not set in stone yet. Satellite data indicates Mitag and Hagibus are both moving at a fairly rapid clip, to the west (see Figure 3.4). It is not yet certain whether land interaction may disrupt one or both of these circulations between any interaction can occur. Of interest as well is the propensity for models to develop yet another tropical cyclone to the east of the current two (Figure 3.3 again), which may induce further complications in the track forecasts for one or both of these typhoons. Figure 3.1. Track models for Mitag. Valid 21/1800. Figure 3.2. Track models for Hagibus. Valid 21/1800. Figure 3.3. Euro model loop from hr 72-240. Valid 21/1200. A special thanks to Steve (aslkahuna) for teaching me much about typhoons and typhoon climatology, and to Josh (HurricaneJosh) for providing me the impetus to post this. Holliday, C. R., and A. H. Thompson, 1979: Climatological Characteristics of Rapidly Intensifying Typhoons. Mon. Wea. Rev., 107, 1022-1034. Getting closer to the Vietnamese coast.